A six days training programme on Shingles Preservation, Truss Design and Panel of Chir- Pine Needles for “Eco Friendly Multi Resistant Hazard Construction Technologies and Habitat Solution for Uttarakhand” funded by Department of Science and Technology Delhi under Time learn programme and coordinated by Development Alternatives , New Delhi is being organized by Wood Preservation , Forest Products Division and Timber Engineering Division of Forest Research Institute, Dehradun from 2nd to 7th April , 2018. 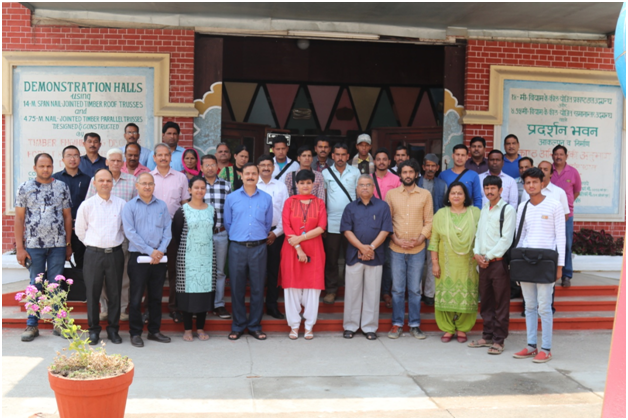 The training is organized for nineteen participants from Uttrakahsi, HESCO , Dehradun and Development alternative Delhi for technology dissemination and capacity building in wood processing . The objective of the training is to familiarize the trainees specially carpenters and masons from hilly region of Uttarakhand for the multi –hazard resistant construction technologies particularly Chir- pine wood roofing shingles technology and bamboo /timber mud reinforcement technology. 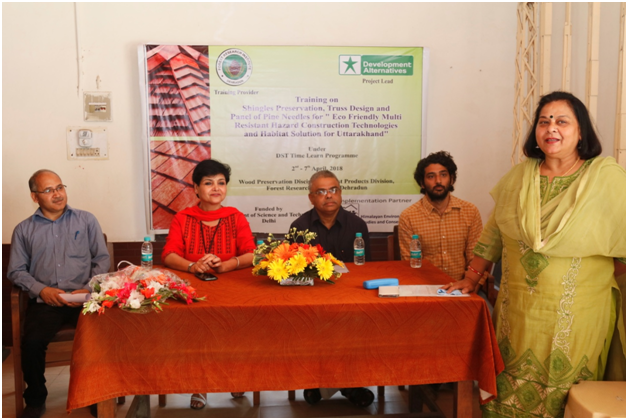 Inaugurating the training , Dr. Savita , Director, FRI and Chief Guest of the event underlined the importance of value addition of timber / bamboo for construction purposes specially in hilly region . She highlighted that this training is in tune with the initiatives of ICFRE aiming to identify the gaps and develop field usable approaches / strategies for taking research from laboratory to land as far as possible to the real workers and users . Dr. Sadhna Tripathi, Course coordinator and scientists of division Shri Ajmal Samani , Shri D.P. 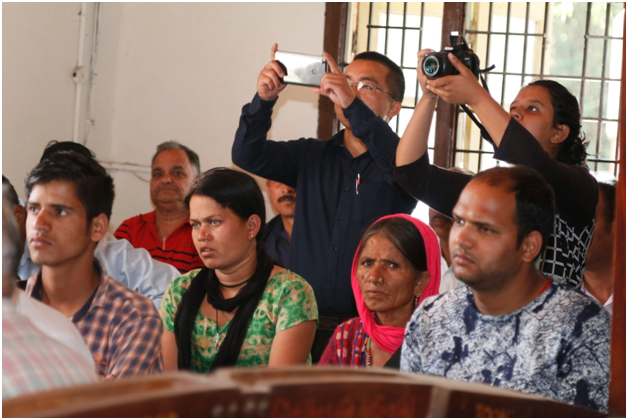 Khali , Shri Rajesh Bhandari , Shri R. S. Topwal , Dr. Kishan Kumar Dr. N. K. Upreti and Dr. Y. M. Dubey and research staff of the division were present .